Vegan Tofu Steaks here I have marinated in Piri Piri and then toasted them. But you can grill them too! 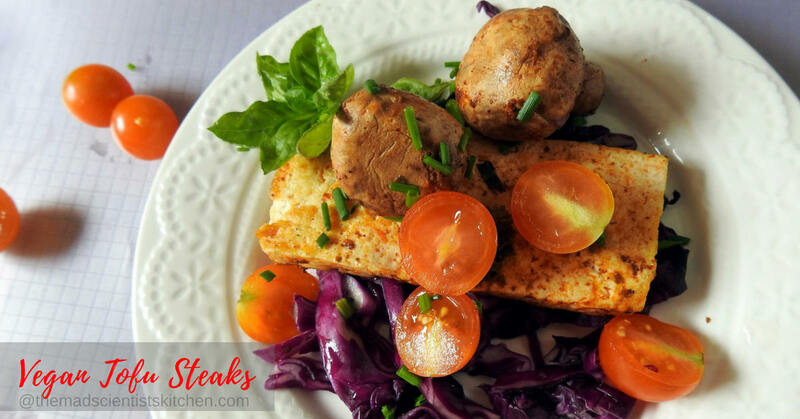 Make these Vegan Tofu Steaks ahead and store them in an airtight container as they can be eaten plain, with a salad, in a sandwich or even added to any gravy of your choice. 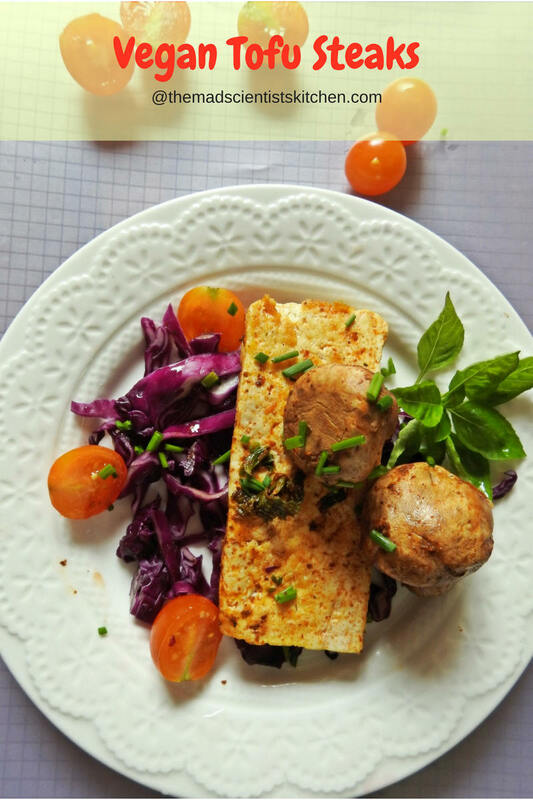 In Blogging Marathon this week I am highlighting Pick one Protein Rich Ingredient and my star of the event is “Tofu” also known as bean curd. Bean curd is relatively new in my household and like any other new thing, you love it or you do not. My husband eats it while father -in -law and kiddo refuse it. The reason I am introducing tofu in our diet is my hubby, we have had a change in our lifestyle. I am slowly phasing out Cheeses, butter, oils and refined flours. These I am replacing with millets, salads, and low-fat foods. I cannot stop it completely right now if not the rest I will be the one with withdrawal symptoms. To make tofu soymilk is coagulated and then curds are pressed into soft white blocks. Again, this can be soft, firm, or extra firm depending on the water content in the bean curd. The protein content in Tofu is high and the calorific values are surprising low. It is high in iron, and it can have a high calcium or magnesium, depending on the coagulants used in manufacturing. The flavour of tofu is subtle and is used in savoury and sweet dishes. An important component in East Asian and Southeast Asian cuisines it is often seasoned or marinated to suit the dish. So let us get down to Vegan Tofu Steaks without much ado. Cut the tofu in thick 1/4 inch thick blocks. I have cut them lengthwise. Mix all the marinade in a big flat-bottomed bowl. The Piri Piri has salt and hence I have not added. Dredge the tofu in the marinade and set aside to marinate for at least 1/2 an hour. I left mine overnight. When ready to serve grease the pan with the oil and lay the tofu slices on the pan. Heat the tofu until it browns to your satisfaction. Flip and fry again on the others side. I have left them soft as we prefer them soft but you can fry till crisp on both sides. Serve on a bed of salad. I have used mushrooms marinated in Piri Piri and cooked in its own juices, red cabbage and tomatoes. You could then wrap the block of tofu in a kitchen towel and still let it drain for say 30 minutes after which you can squeeze the water out holding the tofu lengthwise in your palms and pressing. I did nothing of this but straight cut it up. 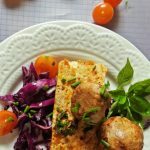 Loving this tofu recipe… simple and nice! You have a flavorful marinade there, Archana. Tofu steaks look amazing. I make a similar version with paneer and my daughter loves it. Your tofu along with the salad looks amazing Archana. I will try with paneer now that you mention it Gayatri. Thanks. I have never had tofu by itself. It is usually one of the ingredients in a dish. Using it as the primary ingredients is such a nice idea! You have plated it so well! Looks appetizing! Super like, i love this incredible vegan tofu steaks. And that plating looks absolutely prefect, feel like finishing that plate. Aww! Thanks Priya. You rock. What a delicious and healthy preparation Archana. I wish I could some tofu here. Making a lifestyle change is tough initially but in the long beneficial for all. You can make it at home Mayuri. Will update you. This is a great pick Arch. When I tried tofu many years ago, even I didn’t like it and haven’t gone back to it. So there was no question of the family liking it or not. I should try it again as the kids are grown up and they may like it. The whole plate looks very inviting! 😀 If your kids like paneer then they will like this Valli. Mine dont. Love the flavors goes into that marination, the tofu must be so flavorful with those marination. Looks delicious and love your presentation. We love Tofu in all its variety. I need to hop onto the piri piri masala and try this variation. Love the salad components as well. That tofu looks fabulous Archana. Love your pics!!! Do add Renu. It tastes just like paneer. 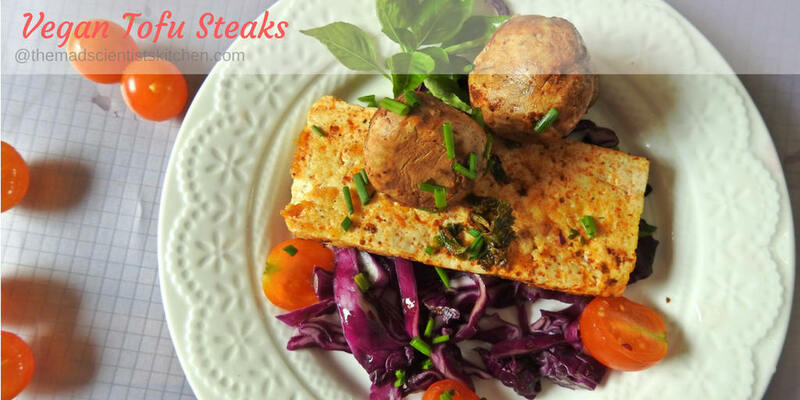 Tofu steaks look fabulous..they are really inviting, very well presented the whole platter sounds like a perfect meal. super Archana. Oh my, that tofu steak looks absolutely delicious. Piri piri masala that you used to marinade tofu in sounds yummy!! try with paneer or chicken Mir. I am literally drooling over the tofu skewers, sounds super inviting.